SPRINGFIELD, Mo. — President Donald Trump urged Congress to act on a sweeping, bipartisan overhaul of the tax system Wednesday, promoting the loose outlines of a plan that he said would ease the burden on "forgotten" middle class Americans while also reducing taxes for businesses. "I want to work with Congress — Republicans and Democrats alike — on a plan that is pro worker and pro American. No more fitting place to launch this effort than right here in the American heartland," Trump said, speaking at one of the city's largest manufacturing plants. His speech offered four vague points for reform, but did not put forth much in the way of policy specifics — something White House officials warned would be the case beforehand. In addition to advocating for a business tax rate of 15 percent, Trump pushed for simplifying the tax code while urging "competitive" tax codes that he said would translate to higher wages. He also called tax relief for middle class families "crucial" and highlighted the need for affordable childcare, addressing a campaign promise spurred by his daughter, Ivanka Trump, who attended Wednesday's event. Trump said he was "fully committed to working with Congress to get this job done" after telling Missouri voters they should vote sitting Democratic Sen. Claire McCaskill out of office if she didn't get on board with his plan. "If she doesn't do it for, you have to vote her out office," Trump instructed the crowd at the top of his remarks. He closed his roughly 34-minute speech with a plea to "at least try to put the partisan posturing behind." During his remarks, the president seemed to subtly slight National Economic Council Director Gary Cohn — an instrumental administration voice on tax reform — when he left Cohn out of a long list of shout outs to administration officials and state lawmakers. "Anybody I forgot?" he asked the crowd after listing off other White House officials like Commerce Secretary Wilbur Ross and Treasury Secretary Steven Mnuchin. Cohn, who days earlier criticized the president's response to white supremacist marches in Charlottesville, Virginia, was traveling with the president Wednesday, according to the administration. The White House told NBC News after the speech that "staff is not typically called out in prepared remarks, only Cabinet members." But Trump has referenced Cohn in previous remarks, such as a June speech in Iowa where he touted Cohn's individual wealth — part of why Trump wanted him for the job. "I love all people, rich or poor," Trump said at the time. "But in those particular positions, I just don't want a poor person. Does that make sense?" White House officials had previewed a populist tone to Wednesday's speech — similar to the message Trump ran on during the 2016 presidential campaign. But the reality disappointed longtime supporters like Ann Coulter, who tweeted angrily about the speech's substance. This is the worst, most tone-deaf speech @realDonaldTrump has ever given. Jeb! had better ideas. Prior to the speech, officials made clear that this was a speech about "vision," not about specifics. "It’s a, 'Why we need tax reform,' not a 'How we’re gonna do it' speech," one administration official told NBC News Wednesday. Another official, in a Tuesday call with reporters, predicted "a very bipartisan speech" that would push for an end to the "rigged system" and instead "work to build a tax code that really allows all Americans to have access to the American Dream and work their way up the economic ladder." 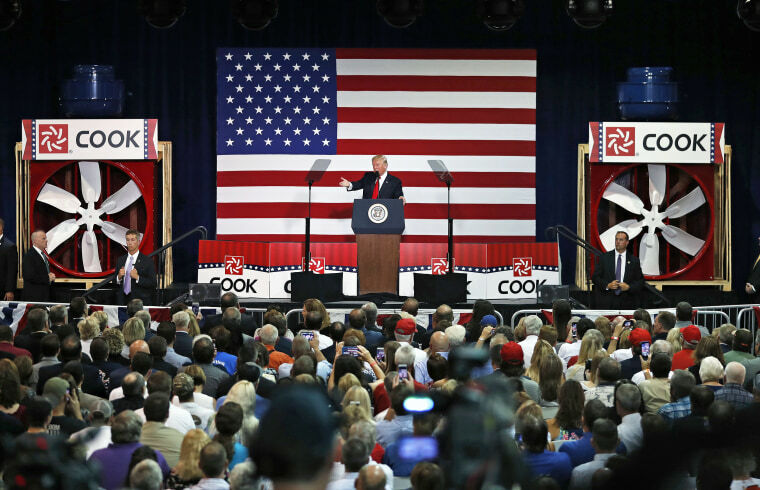 Trump spoke the Loren Cook Company, one of the city's largest manufacturing plants, a day after his visit to storm-ravaged Texas. The policy push comes months after Cohn and Mnuchin released one-page guidance on the White House's tax reform plan, listing guidelines like going from seven tax brackets to three and a 15 percent business tax rate. The president, for his part, has talked about the need for both tax cuts and tax reform during his time in office. Just last week, buried in headlines about a pardon for former Maricopa County Sheriff Joe Arpaio and threats to shut down the government to fund his oft-promised border wall, Trump told the crowd attending his Phoenix, Arizona, campaign rally that they were "overtaxed." He promised he would get their taxes down. Will be leaving for Missouri soon for a speech on tax cuts and tax reform - so badly needed! The White House has said it is working closely with Capitol Hill's so-called "Big Six" on the legislative specifics of the bill, with administration officials telling NBC News that they feel it's the "best way" to get tax reform done. Looming over this big legislative push on tax reform is the failure Trump and fellow Republicans endured on health care, unable to make good on a years-long promise to repeal and replace Obamacare. The sting of that failure was evident in Trump's speech Wednesday. "I don’t want to be disappointed by Congress, you understand?" he said. "I think Congress is going to make a comeback." But the Marketer-In-Chief had done little to push the healthcare initiative, leaving legislative logistics largely in the hands of Republicans on the Hill and prodding GOP Congressional leaders to continue pushing to repeal and replace Obamacare even after the effort publicly and dramatically failed. The administration said the site of Trump's Wednesday tax reform push was symbolic. "Springfield is the place where Route 66, commonly referred to as 'The Main Street of America,' got its start. And now it’s going to be the place where America’s Main Street begins its comeback," an administration official said Tuesday. But Trump's Missouri appearance also presented a reminder of McCaskill's balancing act in the state ahead of the 2018 midterms, when she is expected to face a tough re-election fight. Before going after her Wednesday, Trump targeted "C.M." on Twitter, labeling her as "opposed to big tax cuts." "Republican will win S," Trump said, likely referring to her Senate seat. Senate Minority Leader Chuck Schumer offered a "prebuttal" to Trump's speech Wednesday, advocating for middle class tax relief as opposed to tax cuts for "that top one percent." "It's middle class Americans, not those in the 1 percent, that deserve tax relief," the New York Democrat said in a call with reporters ahead of the president's remarks. "We Democrats will not go along with a tax plan that includes a tax cut for those who need it the least."